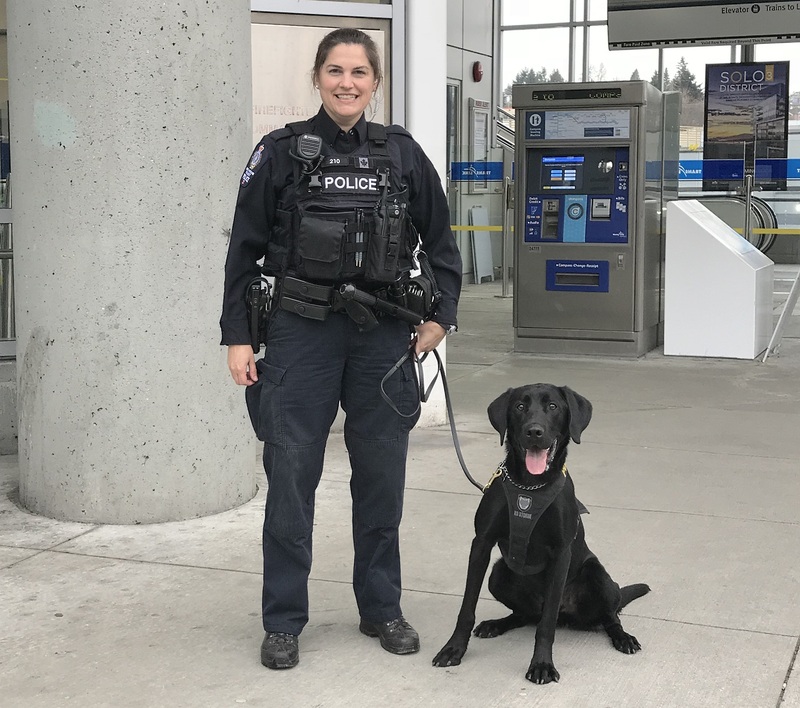 From a young age, Constable Leanne Smith, Police Dog Handler with Metro Vancouver Transit Police aspired to do the very job she does today. Cliché perhaps, but growing up with dogs of her own fostered an admiration and appreciation for the canine cop role. Leanne’s first attempt to enter into policing didn’t go as planned. Despite drive and desire, her young age and lack of experience was a barrier to employment. Armed with the advice to gain some life experience before reapplying, she did just that. Leanne became a Paralegal at a downtown law firm, but her strong interest in the law and process wasn’t enough to keep her from yearning to get out from behind the desk and into an ever-evolving role free from routine. Today, Leanne feels very fortunate that this has become her reality. Leanne is one of four police dog handlers with the Metro Vancouver Transit Police, and the only two legged female on the team. Her partner Diesel is an energetic black lab trained in explosive detection. No two days are the same for this duo, but a typical shift includes sweeps of various areas in and around transit to look for anything out of the ordinary and to search for explosives. Leanne and Diesel can usually be found at SkyTrain Stations, West Coast Express, SeaBus and on the bus. 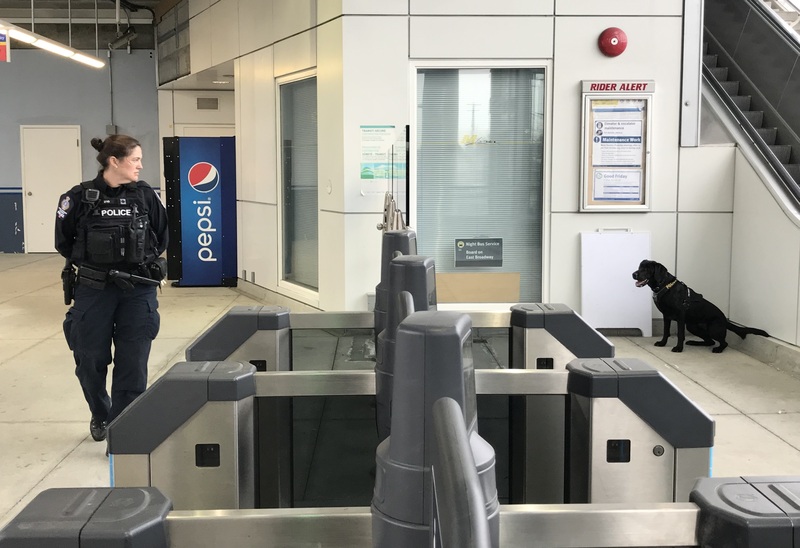 In addition to keeping Metro Vancouver’s transit system safe, the Transit Police K9 also assists neighbouring jurisdictional police departments with their bomb detection needs. Being a dog handler requires an immense amount of self-motivation. Aside from the early mornings and long days, the majority of each shift is spent working independently. A high standard of daily training for both the dog and handler is imperative. Much like their human counterparts, the four-legged members of the dog service unit need each shift to be interesting and challenging to ensure their drive to work is kept high. This keeps Leanne busy always looking for ways to keep the job interesting and relevant for her partner. Leanne attributes personal goal setting to the success she’s seen so far in her career. When asked her opinion on barriers to female leadership in policing, Leanne believes that one the most significant barriers is simply women trying to prove themselves physically and mentally against their male counterparts. Leanne doesn’t attribute her success in this male dominated career to any one woman in particular, however believes that every woman who has touched her life, past or present, has inspired her through encouragement, kindness, and action – positive and negative. Every experience and connection has added to the person that she is today, and for that she’s forever grateful. Thank you Leanne for sharing your wisdom and insight with us! We look forward to seeing what the future holds for you and Diesel. Transit Police took the plunge and were #FreezinForAReason!